The Club of Rome has posted a press release on its website on the presentations and discussions in a number of meetings Club of Rome members Ian Dunlop and Tapio Kanninen had at the United Nations in April 2013 (see http://www.clubofrome.org/?p=5984).Some articles on the events, see “Press” of this blog. Tapio Kanninen had also in May presentations on “Crisis of Sustainability” at Lappeenranta University of Technology and Aalto University in Finland. The presentations followed the same content as those given at the UN by Ian Dunlop (see http://www.clubofrome.org/cms/wp-content/uploads/2013/03/Ian-Dunlop-Presentation-UN-New-York-16th-April-2013.pdf) and Tapio Kanninen (see http://www.clubofrome.org/cms/wp-content/uploads/2013/03/Tapio-Kanninen-Presentation-UN-New-York-16th-April-2013.pdf). “Crisis of Global Sustainability” was launched on 14 February 2013 at Aalto University and on 15 February at Helsinki University. The photo of the 15 February launch is attached. Several launch events of the book are planned in Finland in mid-February but dates are not yet firm. The Geneva Center for Security Policy (http://www.gcsp.ch/) will host a launch on 15 March 2013 in Geneva. WMO and Club of Rome experts will participate as commentators. A launch in New York is in the planning stage. 1. Ian Dunlop, former senior executive at Royal Shell – now talking about the necessity of moving immediately from the use of oil and other fossil fuels to renewables and nuclear – gave a key-note speech at the Finnish Project Association’s Conference at Dipoli, Espoo, on 14 November 2012. The speech – 27 minutes long – gives a short but powerful presentation on the emergency situation of the globe and some actions that should be done immediately. At the end Dunlop is referring to the book “Crisis of Global Sustainability. Watch the video here: https://vimeo.com/53540204. 2. On 16 November 2012 Tapio Kanninen gave a presentation at the Legal Lounge in Helsinki (on the concept of Legal Lounge and the announcement of the talk see http://www.lawlife.fi/news.php#uutinen5). The slides used in presentation are added later. In addition to the slides, Kanninen elaborated on the concept of a sustainability center both in developing and developed countries (on the concept of a sustainability center in developing countries, see the blog entry on the center concept in Tanzania). 4. 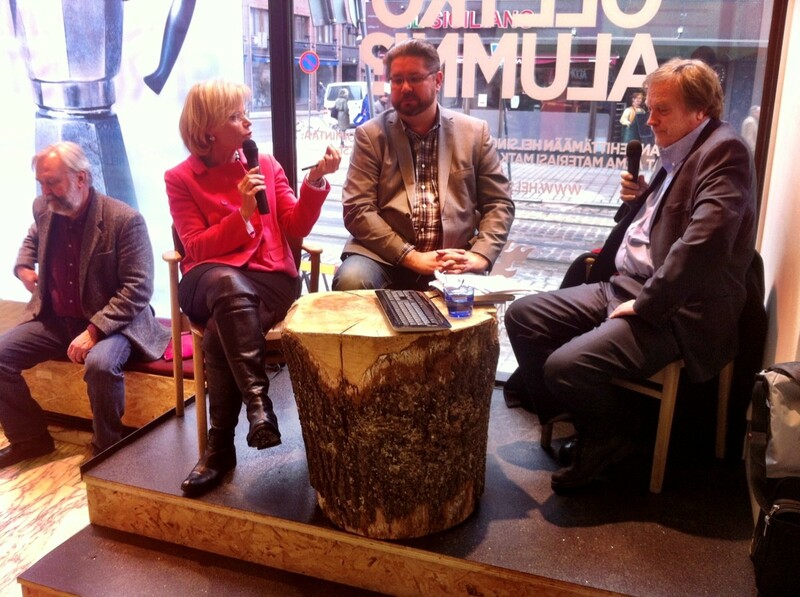 On the following day, 20 November 2012, some Finnish politicians and the editor of Kauppalehti -journal discussed the key message of the above interview of Kanninen and Dunlop in the morning TV program “Jatkoporssi”. Watch here, available only in Finnish at 11:55: http://areena.yle.fi/tv/1747221 . 4. On 21 November 2012 Tapio Kanninen spoke at Philosophy Club in Helsinki about his book and games that could be useful in spreading the awareness on a global emergency. The announcement in English, after announcement in Finnish, and a detailed description of the presentation and discussion but only in Finnish, could be found here: http://filosofiklubi.blogspot.fi/2012/11/klubi-ke-2111-klo-1700-fm-phd-tapio.htm. English slides will be posted later. 5. On 22 November 2012 Tapio Kanninen was interviewed for 55 minutes on his book in the Finnish radio (Politics radio “Politiikkaradio”, reporter Sakari Sirkkanen). It was rebroadcasted twice in the following days. Listen here, available only in Finnish: http://areena.yle.fi/radio/1718591. During the past few years a lot of work and research was undertaken to establish a new type of a global crisis network with a coordination unit in New York and regional, national and local centers to be set up around the world. They would all be interconnected and jointly contributing to solving any future global crisis, a major topic of the book. So far funding has not been successful to move to the implementation phase except for the setting up of the Helsinki Sustainability Center (described separately in this blog) in September 2012. This entry below gives justifications for the establishment of this network. The book tells in Chapter 8 that the Research Unit for Strategic Intelligence and Exploration of Futures at the Aalto University in Helsinki organized a seminar on the idea to establish the global crisis network in September 2010 so that the world would be really prepared for any major crisis of the future as described elsewhere in the book. The Social Science Research Institute of the University of Hawaii at Manoa (UHM) sponsored another seminar in Honolulu, in November 2010 and the consultations were also conducted in fall 2010 with the Globalization Research Center of UHM, the East-West Center in Honolulu, the Research and Analysis Corporation of Finland, and the Stockholm Resilience Center in Sweden. The book Crisis of Global Sustainability further tells that there already exists an example of a well-functioning regional-global interplay of centers in the area of political analysis and advocacy. The International Crisis Group (ICG) provides early warning on and monitoring of political crises, and advocates for action through a wide network in regions and conflict countries. The concept should be expanded and modified to deal effectively with interrelated global threats of the future. 1. First, the global coordination unit should work as a think tank. Traditional think tanks undertake research, organizing seminars, and give advice to decision-makers. The book refers to International Peace Institute (IPI) which, although operating independently of the UN, has acquired a semi-UN status over the decades, which enhances its legitimacy and impact—but as with ICG it only works in the political and security arenas. The IPI would be a good model for a Global Crisis Network and New York unit in terms of access and building the legitimacy of a network with a close connection to the Secretary-General, UN organs, and the UN system, but importantly, while maintaining its independence. Second, the Global Crisis Network and its New York coordination unit should jointly act as a crisis center and early warning mechanism. Many Governments have crisis centers and the UN Peacekeeping Department a situation room, with similar crisis management functions, and there are several other such entities around the world that have been established to constantly monitor potential natural catastrophes. Third, the Global Crisis Network and its New York unit should function as an operations room for practical, on-the-ground projects. Richard Branson’s Carbon War Room which the book described in Chapter 7, is a good model for this function but the concept should be expanded to cover all global threats, concerns, and their interlinkages beyond climate change. It should be a center bringing together such partners as the private sector, local and central government, foundations, the UN system and NGOs, with the help of the latest technology and appropriate funding. 1. Developing countries in particular face three major challenges and GlobCriNet could be instrumental in helping to find solutions to each. First, climate-change-related issues such as natural disasters, and food and water security are mostly felt locally but their solutions often require international funding and technology. However, such international assistance is often poor at identifying the most important local projects, as there are inadequate links between local, national, regional, and global efforts to combat climate change. A holistic framework is missing. The Global Crisis Network would address this concern by providing a framework for coordination and new possibilities for initiating badly needed projects in the field. 2. Second, seen from the global – or macro-perspective, the most critical problems are not necessarily addressed at the local level, as there is little awareness locally of their long-term impact on the globe and consequently inadequate political will, expertise, and funding for mitigation projects. GlobCriNet would work to acquire appropriate funding, technology, and expertise for such local projects. Working closely with the UN system it could be argued that the network will gain both the legitimacy and global expertise to make suggestions for critical national or local projects from a global, holistic perspective. Such recommendations would arguably have significant political clout and credibility. The book notes that massive amounts of research, analysis, and data are already available around the world but a major problem is how to get the most relevant information to the right decision-makers in an understandable form. There needs to be a broker or facilitator between the knowledge and the user. During a rapidly evolving crisis this is especially important, stressing the importance of the coordination and brokering functions of the New York unit as well as the whole network. The function of seeking and suggesting cooperation with other institutions would make the network unique among institutions dealing with interconnected global, regional, national, and local threats. In the third phase, a network of institutions in pilot countries should be established. The possibility of establishing a specialized regional center should also be explored. Operational conduct of a network (e.g. priorities of action) should also be set up and it might vary from a region to another”. The Chapter 8 in the book concludes that the New York coordination unit could be established at any time but at the latest when the first regional network is operational. Climate change might be a good start for topical coverage by the first network, but in principle all relevant issues should be covered in due course. A feasibility study could and should determine the cooperative arrangements of the Global Crisis Network with other organizations, such as those listed in the beginning of this chapter, as well as whether linkages should be established to social forces and movements now spreading around the globe. Those interested in the concept described above should send proposals to this blog how the network and/or its components could and should be established in practice, or even better yet, they could set up their own networks or centers which would eventually be connected to the Global Crisis Network once funding is secured for the feasibility study mentioned above and for the funding of the coordination unit in New York, Funding is an essential part of the establishment process and suggestions for concrete initiatives in this respect are welcome. No special fundraising is going on however at the moment. Some catalyst funding might be needed but essentially the setting of the Global Crisis Network is self-organizing, democratic, voluntary and transparent process without a central authority or command. Any coordination is based on suggestions and offers for assistance and ideas, not on command. The Temple of Understanding and Interfaith Consortium for Ecological Civilization will organize the second session on the spirituality and environmental action on 18 April 2013 in New York. The first session took place at the Open Center in New York in late December 2012. See above the link to the invitation. In summer and fall 2012 some spiritual people of various faiths and religious associations, but also concerned about the deteriorating trends in our climate and environment, gathered in Finland and New York to discuss how spiritual people around the world should be mobilized to move things around. The men and women of faith and spirituality represent an overwhelming majority of people on earth and are therefore an important asset to change the planet toward a sustainable future. After these meetings and further consultations it was decided that an interfaith movement, a world prayer and meditation network for environment, climate, peace and our economic and spiritual well-being should be established. Contrary to many other existing networks its efforts should be very practical, namely joint prayer and meditation should lead to concrete action as explained below. All religions and spiritual traditions share, at their heart, a common vision for preserving and promoting the well-being of both humans and nature and for an aspiration of continuous spiritual progress and peace through prayer and/or meditation. We are all part of the same globe, and its climate and natural resources are making us all interdependent – a fact more evident today than it was decades and centuries ago. Some call this universal unity-consciousness that we are all one, and the sustainability of the nature is part of our heritage and our ultimate destiny. Mother earth nurtures us and, on the other hand, we all have a responsibility for its health as well. If the environment and the climate around us deteriorate we all ultimately also become sick. When we are healing our human environment we are also healing ourselves and rising up the humanity and our collective level of consciousness. The science tells us that the planet is exceeding its ecological limits and it urgently needs deep-healing that only humans working together and coming from all religions and spiritual traditions can give to it – indeed it is our highest and now even an urgent duty. It is time to act together but with joint vision, purpose and action. Action is key as each one of us is instrumental for proposing and implementing concrete steps to improve our environment and thus creating the harmony and health that lifts our spirit and soul. The world prayer and meditation network for environment, climate, peace and economic and spiritual well-being is an interconnected forum for doing this together. We need to get together for a joint, shared session as in the group we can achieve more that individually. Therefore, we urge you to join us in a session ,or you can organize one yourself in your community. This would not be as such a religious but rather inter-spiritual, inter-faith session uniting us for a common purpose. To start with, we need a facilitator who is passionate about the above mission statement and can deal smoothly and friendly with very various kinds of people. And we also need an expert on scientific facts on what is happening to our environment. That’s all – this is a small-scale grass root event which will eventually change the world. 1. The facilitator first explains the purpose of the session. A guided prayer for healing the planet for some 2-3 minutes follows but the facilitator might first very shortly explain the power of prayer and meditation (or maybe in some traditions a silence of mind with attuning it to God or the highest spirit) common in all religions and spiritual traditions. Then we all sit in silence for some 3-5 minutes. Each one of us can and should use the prayer or mediation according his or her own religious or spiritual traditions and beliefs during this time. No one will be converted to anything. When we sit silently for a while in a harmony of a group we can achieve more once we start working together. 2. Secondly, there should be a power point or other type of scientific presentation for some 20 minutes or so about trends in our environment: climate, natural resources, water, pollution etc. This should be a non-political talk for knowledge and understanding in a similar way as a medical doctor describes a diagnosis to a patient to the best and honest understanding of the doctor. The presentation should be given in a spirit of humility as we do not always know everything as a scientific fact as science is evolving but we should be able to get a broad picture. 3. There should be a short question and answer segment after the presentation with the facilitator and the scientist/statistician/expert giving the factual presentation. During this time participants could be directed to study more in selected websites, books and other documents. 4. Then the facilitator breaks the participants into small groups where each one can take part and express his or her views. One group could be on actions to be taken in one’s house/apartment and in one’s living style; another group could discuss what could be done in a neighborhood (complex of apartments or houses, or a village or suburban community); and a third one could be for actions on what could be done at city, county, national and international levels. 5. After the work in small groups is finished the facilitator calls for a joint session where the groups report their findings (using blackboard or other facilities). Then groups or individuals make commitments for action – either publicly or silently – and also brainstorm jointly how to monitor progress (including whether or not to organize a follow-up session or sessions, whether or not to report the results of the session in a website or a blog to spread the message, etc). 6. The session ends with the facilitator calling for silence, prayer and meditation in two stages. The first part is a prayer and/or meditation during which each participant can think in his or her mind what one has committed of doing and asking God or other high spirit or entity – according to one’s spiritual or religious tradition or belief – to help him or her to implement the commitments given publicly or silently in order to help the environment and us all to heal and prosper. Secondly, the facilitator asks for a general silent moment during which the participants harmonize their energies for well-being of all humans as well the mother earth. The first pilot session of the network is scheduled to take place in December 2012 in New York. Its results, to be reported in this blog, will give a useful model how future events could be best organized to get concrete results. c) Angry Birds Environmental Game: birds coming back to politicians and industry executives who have destroyed their nesting areas; profits could go to a global sustainability fund. The “Civilization” game has been an extremely popular strategy game for decades. You build civilizations from some factual premises and with a lot of anticipated problems. These have always been ancient civilizations, although the game developers have now also started to look into the future. We need something similar but going beyond the original concept where young people can build world civilization alternatives for the coming decades which are really sustainable, moving from the past to the future as a game platform and using real data as a basis. 1. There are a number of tipping points that can trigger an escalating global temperature rise and sea-level rise, as discussed in Chapter 5 of the book Crisis of Global Sustainability. The article referred to here talks about some 15 tipping points (see http://www.pnas.org/content/105/6/1786.full.pdf). These tipping points and their interaction, feedback, were not taken into account in IPCC projections in 2007 as they were considered too much of an unknown, an uncertainty (the next IPCC assessment report is only due in 2013-2014 – and as governments are involved it is always going to be a watered-down report). The IPCC and related mainstream scientific assessments expect a sea-level rise of about 0.2–1 meter within a century – so not a catastrophe. 2. James Hansen and Makiko Sato, however, tried to estimate the impact of tipping points from paleoclimate analysis in a recent essay and concluded that a much more drastic sea-level rise is likely: a 4–25 meter sea-level rise with business-as-usual trends within a century (See reference below). Cities like New York, London, Shanghai and Tokyo will be wiped out (see the discussion in Chapter 5 of Crisis of Global Sustainability). This view will most likely be contested by mainstream scientists. On the other hand, the stakes for humanity are huge if this science turns out to be correct. So even if there is only a 5% probability that the Hansen-Sato analysis is correct, this likelihood justifies the efforts to take it very seriously into account. 3. Evidently science will start modeling more and more the impact of tipping points in the years to come and a lot of data are and will be available. But with IPCC projections – on which climate change talks are based – already out of date when they are released, and even watered-down as compromises, climate change negotiations by governments are always behind the science. Therefore there is an opening and a real need for creating a democratic, transparent, on-time/real-time initiative like this Tracker. Create an Interactive Sea-level Rise Tracker based on real-time data, which could be developed into a real-time application like Navigator, or a game, or both. Create a database using various online databases: the latest data from world monitoring sites on CO2, the rate of glaciers melting, etc. Ideally, the younger generation would also use this Tracker application to follow climate change negotiations with their mobile devices like sport fans who currently watch sport events with a lot of data on players, or like stockbrokers who use Bloomberg News on their computer screens to make trade decisions. But this could go further. The younger generation could test and challenge the negotiation targets of their governments’ negotiators, in terms of sea-level rises, that various governmental negotiation positions would bring about – an exercise of grassroots democracy in action. Please present your own comments or ideas on the above, or better yet start developing a commercial application (but devote part of your profits for sustainability causes such as a global sustainability fund – still to be established). Some suggestions with regard to the above game ideas were presented by Alison Neale from the UK in the process of preparing the book “Crisis of Global Sustainability.” They are reproduced below as a model of what kind of comments and ideas – some tentative illustrations based on one’s own experience, some more elaborate gaming proposals – we would like to receive so that the concept could be developed further. “I really like the Civilization game idea. My brothers were both totally addicted to this. I imagine there is an app already, but you could come up with something completely new that allowed people to try different solutions to environmental problems being identified. Thus you could have your domain – a village, city or county/state – and the game would tell you that an unusually large weather event is incoming. You would be able to plan to avoid it – do you use your limited pot of money to evacuate, build shelters, invest in something to prevent future events, etc? The game would be to work out what would be better in the long versus short term, including monetary, crop and human losses, and gauge reactions of all players versus actual events in history. It would be a bit like some of these research projects using Twitter at the moment, where you get to monitor people’s responses to policies and theories, and crowdsource solutions. You could even introduce the whole ‘dream team’ element of sports computer games, by having prominent environmentalists (or stereotypes of such), and form your local or state government using these, to see how well policies hold together under different theories. I know there are some very, very simple games on Facebook, such as Farmville, for example, that work along similar lines of starting with a small plot and a bit of money, and then you gradually expand. I’m not a games player, but my brothers, sister-in-law and ex-partner are all totally addicted to them, so (sigh!) I know the kind of thing that hooks people in. Oh, there are also fortress-style games, where you have to protect your maze-like base from invaders. The type of game has a particular name, which escapes me at present… That format could be easily adapted to invaders in the form of crises of different types. They are available as apps on the iPad, I know. References: James E. Hansen and Makitoki Sato, “Paleoclimate Implications for Human-made Climate Change,” in Climate Change: Inferences from Paleoclimate and Regional Aspects, ed. Andr Berger, Fedor Mesinger, and D. Šijački (Springer, 2012).